JOHANNESBURG: The mosquito-borne virus chikungunya may lead to severe brain infection and even death in infants and people over 65, a new study has warned. The study, that reviewed a chikungunya outbreak on Reunion Island off the coast of Madagascar in 2005-2006, showed that the rate of brain infection, or encephalitis, from the chikungunya virus is higher than the rate seen in the US due to West Nile virus and similar infections between 1999 and 2007. According to the US Centres for Disease Control and Prevention, outbreaks of chikungunya have occurred in numerous areas, including Africa, Asia, the Caribbean islands, and as of September 2015 more than 7,000 cases have been reported in Mexico, the researchers said. The most common symptoms of the infection are fever and joint pain. Most people recover within a week. For some people, the joint pain can continue for months and even years. “Since there is no vaccine to prevent chikungunya and no medicine to treat it, people who are travelling to these areas should be aware of this infection and take steps to avoid mosquito bites, such as wearing repellent and long-sleeves and pants if possible,” said study author Patrick Gerardin, of Central University Hospital, in Saint Pierre, Reunion Island. The epidemic of the virus on Reunion Island affected 300,000 people. For the study, researchers looked at whether people with neurological symptoms at disease onset were still affected three years later. 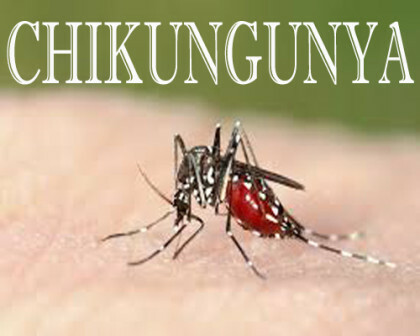 A total of 24 people had encephalitis that was associated with chikungunya virus, for a cumulative incidence rate of 8.6 per 100,000 people. Encephalitis was more likely to occur in infants and people over age 65. The incidence rate in infants was 187 per 100,000 people; it was 37 per 100,000 people in people over age 65. “These numbers are both much higher than the rates of encephalitis in the US in these age categories, even when you add together all the causes of encephalitis,” Gerardin said. The death rate for those with chikungunya virus-associated encephalitis was 17 per cent. An estimated 30 to 45 per cent of the infected persons with encephalitis had persisting disabilities. The disabilities included behavioural changes and problems with thinking and memory skills in infants and post-infectious dementia in previously healthy adults. “The consequences of this encephalitis seem to be particularly harmful in newborns,” said Gerardin.